Police Report: On Friday evening, Rs. 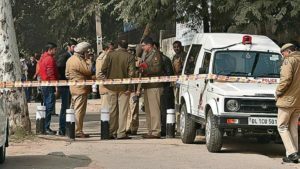 1.4 crores were robbed from a businessman at the Rani Bhag Area in the outer Delhi by men who were riding motorcycles. The incident happened on Friday evening, when Businessman Vinod who is a resident of the Rani Bagh area, was on his way to his home when men riding motorcycles stopped his car. The men wearing helmets pointed a gun on Vinod and forced him to get out of his car. One man drove his car that had Rs. 1.4 crores, the other men used their motorcycles to run away. The thieves drove the car for about a mile before they abandoned it. The car was recovered by the police, they also found the bag that had the money in it, but it was empty. The police are trying to recover fingerprint marks from the car which can help them identify the men who did the crime.